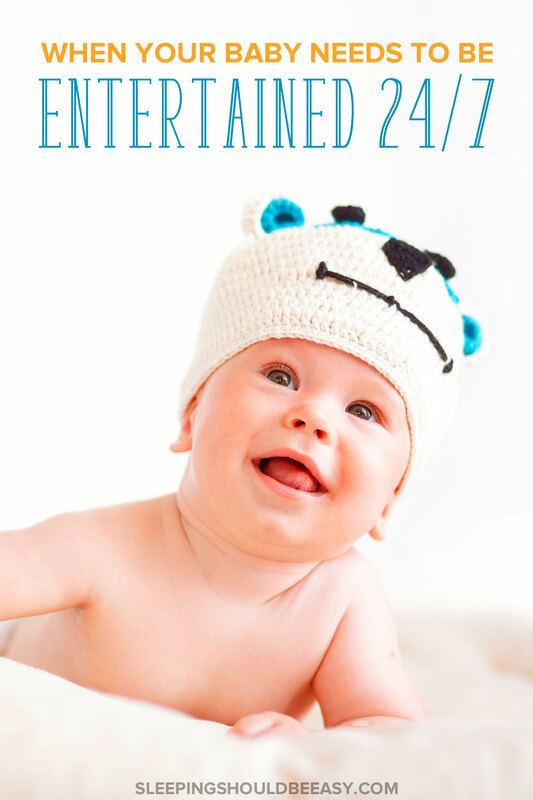 Frustrated because your baby needs you to entertain him? Here’s what to do when you have to keep baby entertained constantly. I had to carry my baby around because setting him down for even a second would make him cry. I shook a rattle, sang songs and played with him every minute because once I left his sight, he’d go right back to crying. And I wasn’t denying him attention—he saw me all day. And it’s not like he was hurt or uncomfortable because he’d be fine the minute I picked him up. Your baby fusses when you step away because this is all he has known. He’s not crying because he’s teething or sick—it’s because he’s used to having you around. His emotions—scared, confused, uncomfortable—is an understandable one if he’s not used to being alone. Understanding this will help you gain perspective and patience, especially as he seems to cry endlessly for you. Sitting in his presence is one thing, but if you’re not engaged, your baby will want to spend more time with you. He needs his “bucket filled”—toting him around in the stroller with zero interaction doesn’t fill it. First-time moms are shocked when they realize how different their lives are with a baby. We can’t read a book for hours or clean our homes the way we used to while the baby sits nearby. His needs are appropriate for his development. In short, kids need us to be there for them. Read more about misconceptions first-time parents make. Gradual weaning means guiding your baby towards more alone time. Like we discussed, being alone when he isn’t used to it can upset him. Instead, you’ll learn how to gradually introduce the concept of playing alone. First, sit with him on your lap. Then, lay him on the ground next to you with toys nearby. If he cries, show empathy: “You look upset. Mama’s right here, love.” Comfort him by rubbing his belly or stroking his head. If he continues to cry, pick him up and place his back on your lap. Don’t get upset or frustrated: this is all new to him. Do this a few times until he reaches a point where he’s fine being out of your lap or arms. If he’s okay laying on the ground, sit a few feet away. Let him know you’re still nearby by either talking or singing to him. Any time he cries, reassure him and, if need be, go back to holding him in your lap or sitting next to him. If he’s comfortable with you sitting a few feet away, place a few toys and books around him and walk around the room. Talk, sing and let him know you’re still nearby. You may not be able to plop your baby in front of toys and expect him to play for 45 minutes. Instead, break the ties a little at a time. Need to stand up to grab a burp cloth? Do so, without feeling obligated to carry your baby with you. He might cry, but these little breaks and separations will let him know you always come back. Don’t beat yourself up if your baby cries because you had to set him down to get his milk for a second. You need to do a few things even if he wants your attention. Only in not entertaining your baby all the time will he learn how to play without you next to him. Make it normal and casual and don’t make a big deal out of it. Your baby will know that you stepping away for a second isn’t something to be afraid of. I noticed that the half hour or so after my twins wake up is when they’re most focused on independent play. Something about being in their cribs for a long time makes them want to explore and play once they’re out. During that time, I tend to my eldest, wash their bottles and do what I need to do before engaging with them. This is the time when they’re honing their focusing skills. Even if I wanted to play with them, they’d rather be on their own. Catch the moments when your baby seems more likely to want to play on his own. What times of the day is he most eager to explore? You’ve got a better chance at stepping away when he’s already engaged. Read more about the benefits of independent play. Do you keep quiet while you feed your baby? How about bath time—do you prefer watching him splash instead of talking? Why? You’re giving her attention during a time when you already “have” to be with him, filling his bucket so he’ll feel more confident to branch out on his own later. You’re of course free to talk to him during regular, non-maintenance times, but engaging when you’re together anyway will give you a chance to help him play by himself. And make the time you spend with your baby count. Babies cling for various reasons, including a genuine need for quality attention. Do you do too many chores around the house without providing attention to your baby? Consider doing them instead during nap and bedtimes (when you’ll do a better job anyway). Read more about how to entertain your baby. Your baby might cry when you leave his sight because he doesn’t know whether you’ll come back. After all, he has a limited concept of time. Sometimes you leave for a few seconds to grab his bottle, while other times you’re gone several hours at work. He can’t tell one from the other, or worse, worries whether you’ll come back at all. How to combat this fear? Play object permanence games such as peek-a-boo. Cover your baby’s face with a cloth before revealing in a delighted way that mommy is still right here. Play the game using items, too. Place a toy under a blanket and pretend to look for it. “Where did teddy go?” you might ask with a big smile on your face. Then pull the blanket for the big reveal. And here’s a children’s book about peek-a-boo my kids loved. Just because he can’t see you doesn’t mean you’re gone (maybe just in the next room or even a few feet away). And he’ll also learn you’ll come back no matter what, just like how you do during a game of peek-a-boo. Plopping kids in front of the TV isn’t going to be effective in the long-run. In the short-term, TV can be a solution when you just need to run to the bathroom or keep your sanity. But kids who watch too much television aren’t able to find active ways to self-entertain. They watch and absorb but don’t learn how to explore on their own and find ways to amuse themselves. Speaking of quick fixes, sometimes you need survival tools so you can run to the bath room or give your arms a break. While these don’t “teach” your baby to entertain herself, they can give you the break you need. Place your baby in a high chair or bouncy seat where he can still see you. Provide him with toys while you tend to household tasks. I keep alphabet magnets next to my kitchen when I need to prepare their meals. Use a baby carrier (like this one). Baby carriers will let you “hold” your baby while leaving your hands free. Make it a game. When a baby is crying because I’ve stepped away to another room, I’ll pop my head back out and say, “peek a boo!” Not being seen (then being seen) becomes a game, buying me some time. Do you struggle with putting your baby to sleep? Wish he could learn to self soothe and sleep on his own? Join my newsletter and discover the 5 mistakes that are keeping your baby from self-soothing! So you’re about to try and catch a moment away from the baby. No more hovering, singing, talking, or holding 24/7. And you’re bracing yourself for the worst. Expect a few tears, some ups and downs and perhaps some frustration on both your parts. But hang in there. As frustrating as it may feel to hear your baby cry, switch from reacting with anger to being present and mindful of his needs. It’s not pleasant, you have a zillion things to do and you’re losing your patience. But with gradual weaning, connecting with your baby and making it fun, you can help him vary his sources of entertainment—and not rely only on you. Extracurricular Activities: Does Your Child Freak Out and Cling onto You? Did you like this article about why you don’t need to keep baby entertained 24/7? Share it on Pinterest and Facebook! 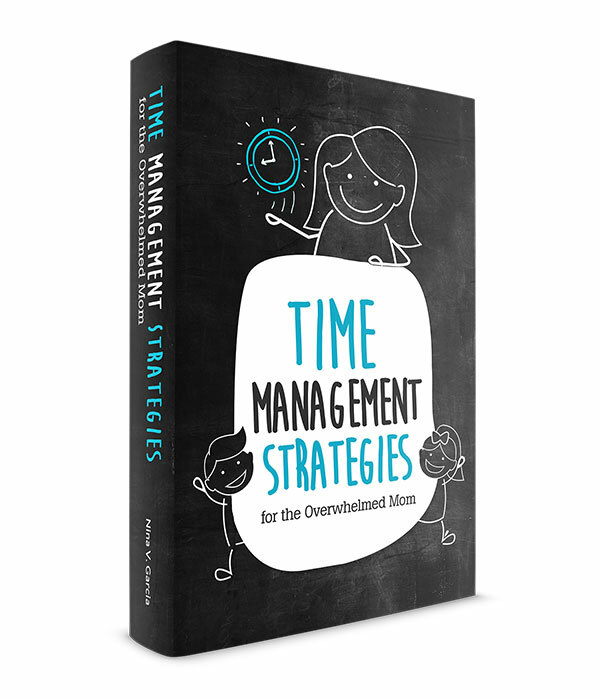 I like your point about time with your baby versus QUALITY, INTERACTIVE time with your baby. I definitely found this to be true when my son was an older infant. If I sat and played with him in a very present, attuned way for a good 15 minutes, he was then much better playing independently than if I expected him to do that from the very start. Exactly, Katie. The times when I’ve given my kids 100% of my attention, even for just a few minutes, usually means they can play by themselves later on. And it generally just makes them easier to care for when you start your day off with them that way. Gosh, with my first, I did not make an effort to leave him for independent play. I was exhausted, to say the least. I hardly put him down and when I did, I was all up in his business over-(not inter-)acting with him. Nevertheless, he’s turned out alright. Now my second, on the other hand, which I’m sure you’ve heard all about already, is complete opposite. As soon as we settled back at home, I put her in her bassinet as much as I could. Sometimes my husband would ask where the baby was. I’d point to the bassinet, where a quiet and entertained baby was, and we’d both shrug and say “Wow. That’s different.” I think the biggest challenge as a first-time parent was not having a clear “game plan” for what I wanted/could do with my baby, so we went with the flow, which mean baby’s flow, not ours. With the second, you’ve got this experience under your belt and you know that if you choose X, it won’t be a bad choice. Heck, if you chose Y instead, you’d be great too. So after our daughter was born, I had a game plan on how to teach her to be independent, how to sleep on her own, and another big thing, not being afraid to let her pout or cry. Haha I knew another mom just like that with her first too, Lisa. She admitted it’s what she did all day long. She’s definitely toned it down much now! I love how you say they’re both fine now because it’s such a good reminder to remember that yes indeed, they’ll be fine. It’s more about our preference and how we want to run our home currently. I think it’s hard to remember it because they truly do like hanging out with us. We’re their best “toys.” The best tactic I’ve found though is to give them your full attention for a few minutes, then they’ll be less likely to demand it more later. Or rather, they’ll be more confident to explore on their own. Oh this is so true. My son had a short phase of needing to be entertained. I don’t remember it being too bad. However, my sister now has a newborn (BTW – she’s loving your post about newborn sleeping habits) and she’s learning the meaning of constant attention. Life is going to be different, that’s for sure! Great tips! I especially like your point about paying attention to the KIND of attention we are giving our kids. It pretty much starts from there: establish that connection with quality time, and they’re more confident to explore on their own (instead of feeling insecure about our love). My baby is turning 5 mos this week. I’m so thankful that I found your post about this topic! I’ve been struggling about this because my baby doesn’t stay long in his crib / stroller / high chair. Looking back when he was still much younger, I would feel guilty leaving him by himself when he’s awake so I would constantly sing to him, talk to him, entertain him. It was great until it came to a phase when he had shorter naps which meant he had more time awake which also meant more time for me to have to entertain him. Before, he could still sit for a while on his rocker while waiting for me to finish eating. Now, things had gotten worse. The time that he could sit still got shorter and shorter. What I’m currently doing is to catch the times of the day where he will be in his best mood to play independently. I have to agree with your post that right after a long sleep or a good nap, a baby would be willing to play independently. So I take advantage of this. Another thing I’m trying is to pay attention to his interests. If I see that he likes a specific toy, I would always give that toy to him while I do some chores. However, this just lasts for 5-10 minutes only. I would try your recommendations and hopefully his ability to play independently would lengthen. By the way, at 5mos how long is the age appropriate length of time that we can expect them to play independently? Best of luck, Sharlene! I don’t remember the exact length of time when my kids were independent around five-months-old. I think at that age, it’s ‘pockets’ of time rather than a long stretch of time. Hopefully the tips will help, especially giving your baby the favorite toys and setting expectations (for instance, cooking long meals probably wouldn’t be practical at this point). I loved those little activity mats with mirrors and things to squeeze. These are great tips and I really like the one about using diaper changing time and similar activities to really engage with your baby. We didn’t end up getting the mats but I know others who swear by them. Kind of makes me wonder if we should’ve gotten them!